A chronicle of ownership of NB Percy and life in general. For the boater and the gongoozler alike. Sad to read two more bloggers are handing in their boat keys for yet to be detailed adventures off the cut. Tom and Jan from NB Waiouru are returning to the penal colony after a five year adventure cruising the canal system. A blog that will be missed by many as Tom's wit is engaging and entertaining. Sadly we never met, they were 'out' when we walked past their boat moored above Shadehouse a couple of years ago now. Not all sad news as my neighbour Mandy is off on her blogging travels again on NB Don't Panic and Bruce and Sheila on NB Sanity Again are off from their lodge confinement covering a decent spread of water again. Plus there are all my other vicarious cruising suppliers over there on the right giving their details of journeys and thoughts aplenty. Hopefully now life is settling down again for us I can get out a bit more, but not quite yet, I have a couple of European motorcycle trip I will record - not for you canally people but for my own dear diary entries to look back on when I am old(er) and infirm(er). So keep cruising and keep blogging please . Percy has a new crew member and I am now a grandad and I could not be more pleased ! Meet Theodore George or Teddy Wells to his friends. He was born Saturday 29th April 2017 8.19am and weighed 7lb 3oz. Hopefully when he is a little bigger and stronger he will be able crew for NB Percy and many many trips will be taken. One of the joys of the canals is exploration of a new area, especially if you have a dog to exercise. I find the police are called a lot less often to me when I am walking and talking to Leia than when walking on my own ! 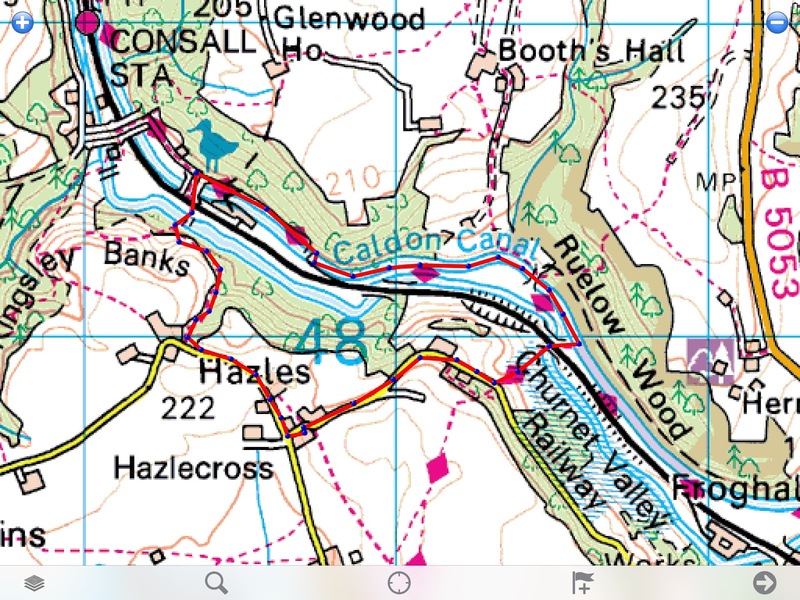 So whilst not on the boat at the moment I (we) have plenty of exploration of the myriad of local footpaths (and canal tow paths) within walking of the new cottage. 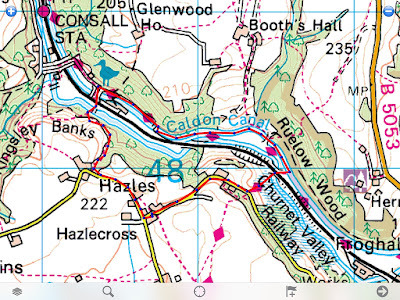 I'll save you the trip into the Valley but it takes us about 12 minutes to the river/railway/canal that all share the valley bottom. 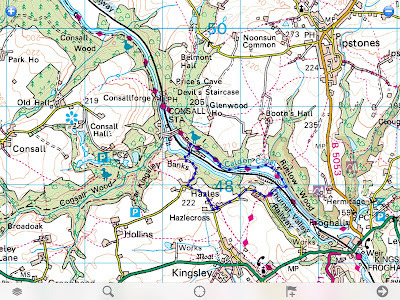 The river Churnet will be a delight to fish - lots pf pools to explore, but I need to know who if anyone has the fishing rights. The river being crossed by the Churnet valley railway. 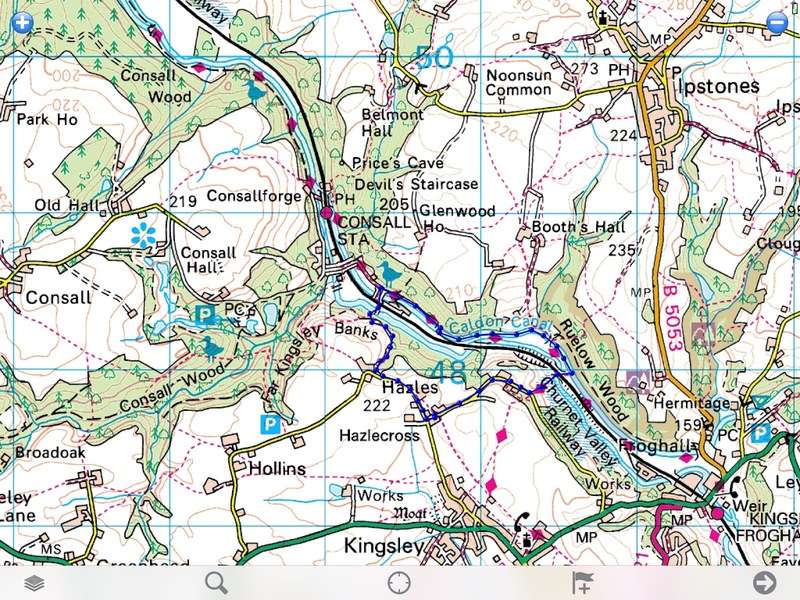 I quite fancy that walk - from Froghall to Etruria - about 18 miles - it's on the bucket list ! Leia was in her element - lots to sniff and no other dogs to worry about - she does not socialise well with other dogs. There is some history here from when the railway company moved the canal to accommodate the railway. The bridge is made up from railway track ! One of the locations the trains have to whistle as they approach - we can hear them from the cottage - very atmospheric. On the lane back to the cottage, looking back into the Valley and the mist rolling from the village of Ipstones. You might be able to see the route we walked in red. 2.5 miles and we did it one night in 50 minutes and today in reverse in 45 minutes, not too shabby if you account for the steepness that gets us both a decent blow on ! This mornings walk was across the fields..... Leia had a decent run, I did not. Update on the rest of my garage. Further point on the journey along the plastic free highway, and a detour down the zero waste lane. Narrow Boat "The Robber Button"
This is really for me to keep track of the above. I intend installing an engine hours counter for oil changes etc.